Hello all, i am new to the forum here. Longtime Gearslutz.com poster, under the same name. 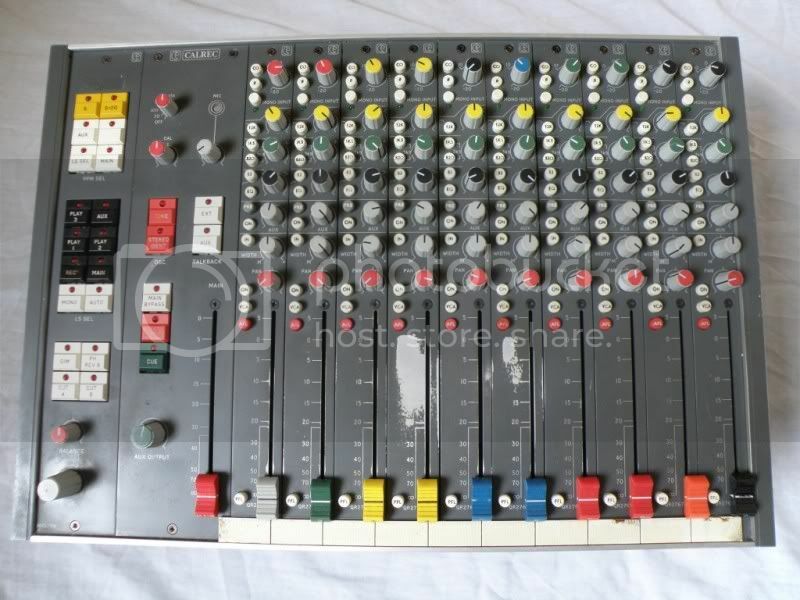 I recently purchased this Calrec line mixer for use as a summing mixer w/Calrec EQ's, and a talkback/monitoring system for overdubbing at my mixing suite. I have many questions and very little information about this board, other than that it's perfectly working and recently was fully serviced. The seller did not know anything about Calrecs. He will be sending me a pinout diagram for the audio connections to this board, thank heavens. FWIW I am prepared for this to be an ongoing project, and i understand that it may not suit my needs in the end. I currently have little to no idea what the routing options are other than the fact that it has 10 stereo line level inputs, one stereo aux buss, a main out, and some sort of cue system with a talkback mic. I have heard that this board was originally comissioned for a video editing suite. One thing i have noticed is that this board lacks any sort of metering. It appears to have controls for metering though, as noted in the upper left hand section of the board labeled "PPM SEL". I'm guessing this is a selection for a set of PPM meters? 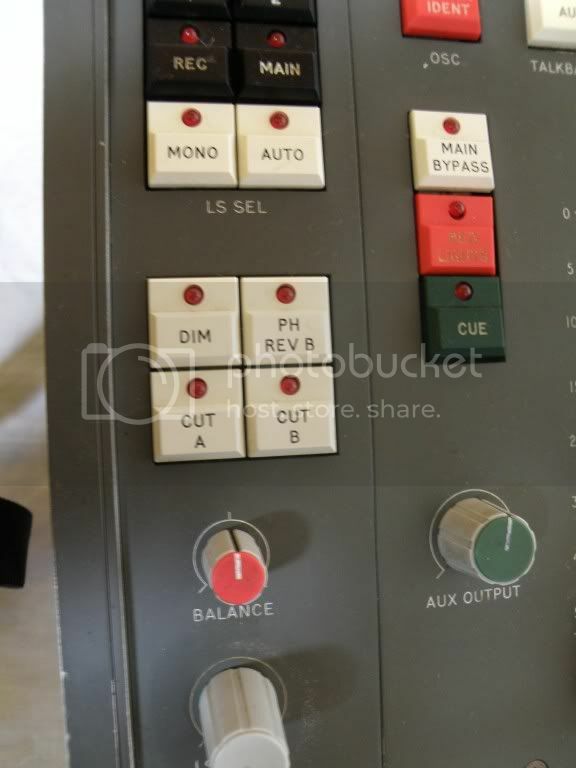 I would guess based on what i know about Calrec equipment and the presence of those buttons that this board originally had some sort of separate meter unit/bridge. Can anyone shed any light on that for me? 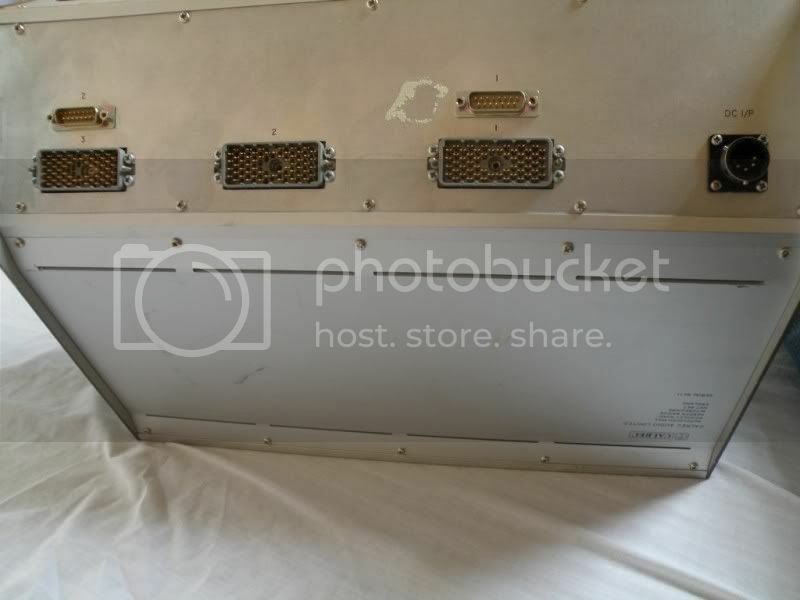 If so, i would be interested in trying to track down a meter unit for it, or i would be willing to build my own. This might be possible if the board sends a buffered meter signal out on some of the pins on the D-Sub or EDAC connectors on the back. 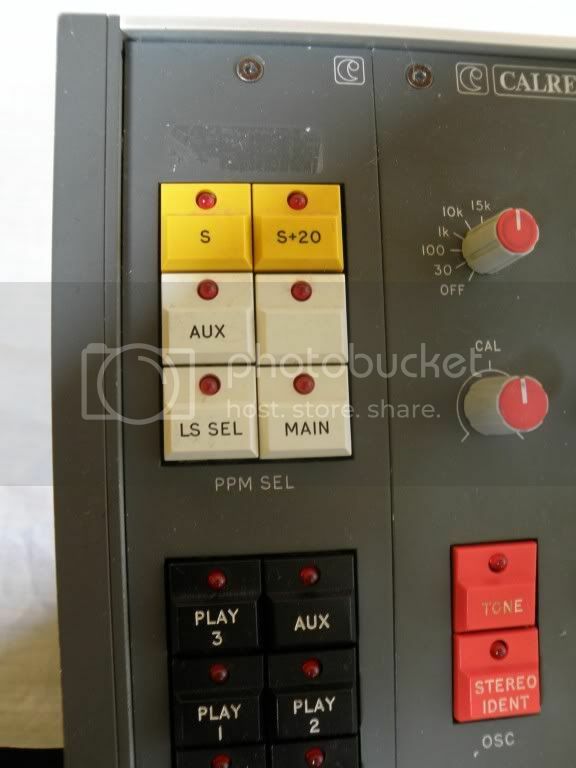 Also, in that same "PPM SEL" range of buttons, im wondering what the two yellow ones labeled "S" and "S+20" are for? I'm guessing that the section of black and white buttons below the "PPM SEL" are for the monitoring selection? They are labeled Play 1, Play 2, Play 3, Aux, Rec, Main, Mono and Auto. Are these for the monitoring of various external sources or the main or aux buss of the console? What is the "Auto" for? Something to do with video editing and the audio needs that go along with it possibly? What does "LS" stand for? Something similar to Control Room or CR? 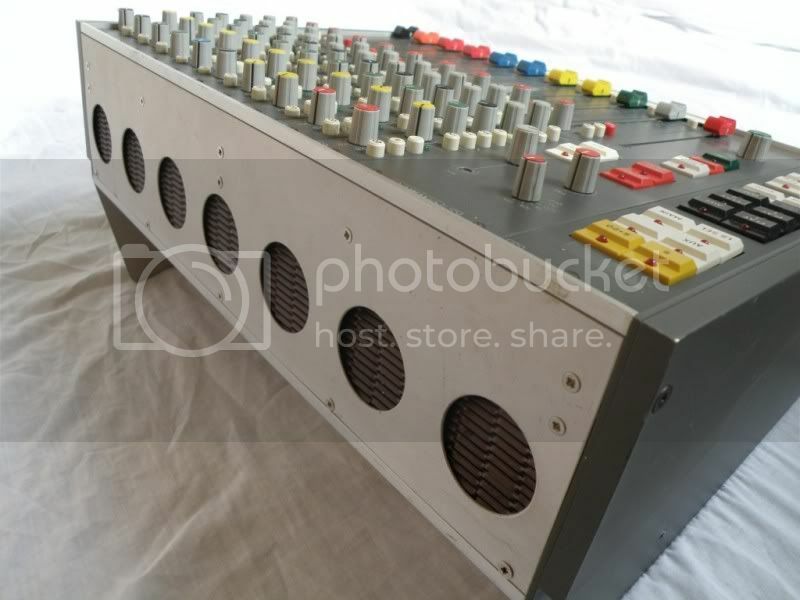 Another question i have is whether or not this particular board has Inserts at all, either on the channels or the master buss. I will probably find out once i receive the pinout diagram but if anyone here knows this answer or anything else related to this particular board, i would really love to hear about it. One other question i have is what the VCA would be doing on those input channels. Each one has a VCA button, but there appears to be no other control-related buttons on the board. Is this for grouping the channels in some way? Or external control from some sort of video mixer maybe? Thanks in advance for anyone that can offer information, stories, tidbits, rumors or anything at all that will help me expand my knowledge and understanding of this board or just about the calrec company itself. I am becoming a Calrec addict. Oh and FWIW i also own a pair of PQ1253 mic amps racked by Boutique Audio, and an RQD-6400 Twin Stereo Compressor/Limiter which i absolutely adore. First of all apologies for the long wait for a reply. In reply to your questions. I have heard that this board was originally comissioned for a video editing suite. "PPM SEL". I'm guessing this is a selection for a set of PPM meters? This board originally had some sort of separate meter unit/bridge. Can anyone shed any light on that for me? Yes it was to feed large PPMs not physically possible to fit in the small frame and to allow customers own selection as required. Usually these are balanced audio out the back. PPM ballistics would be taken care of as part of meter drive circuit. Also, in that same "PPM SEL" range of buttons, im wondering what the two yellow ones labeled "S" and "S+20" are for? These are associated with metering, S stands for Stereo component or difference and is derived by mixing one leg of stereo pair with the phase reversed other leg. Thus creating a Difference signal. The mono components cancel and leave the stereo element. The S+20 adds 20dB of gain to this signal to enable it to be seen on the PPM if required. It is important in broadcast to check that when listening on a radio or TV with 1 loudspeaker, or mono set, that there wouldn’t be a loss of volume when listening to a stereo program. Typically this was associated with a Mono signal as well. “Sum and Difference”. 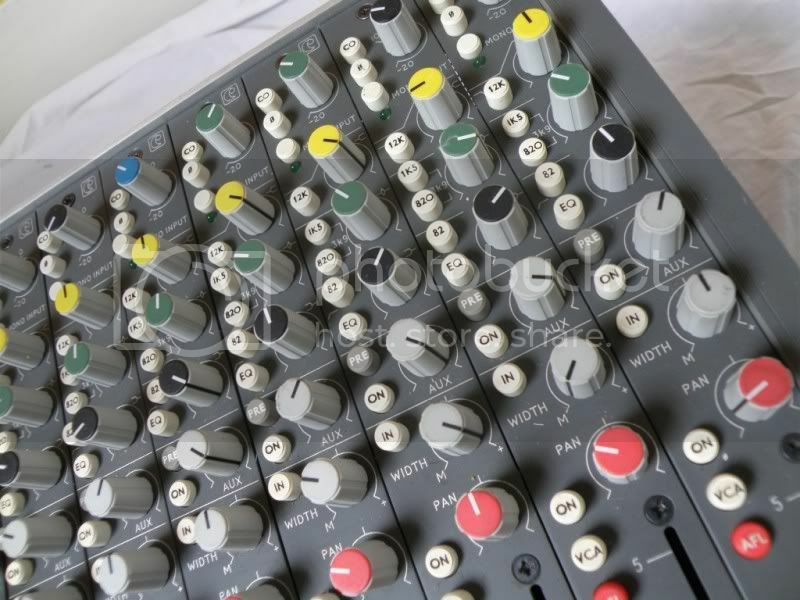 Most broadcast mixers had a button to switch the stereo meters to meter this. The left meter usually Mono and the right the difference. More expensive mixers may have had a permanent meter displaying this as well as stereo. Orange and white needles. What is the "Auto" for? Something to do with video editing and the audio needs that go along with it possibly? The auto allows the audio to follow the video selector often associated with video editing/monitoring. Each one has a VCA button, but there appears to be no other control-related buttons on the board. Is this for grouping the channels in some way? Or external control from some sort of video mixer maybe? External control, could be used to create an auto fade from one video to another. DC control voltage. Hope fully you have the pinout by now.